Lyon Fe/Cu/Au skarn, Nevada, USA. Au/Cu in magnetite, Tennant Ck., N.T., Aust. The Upper Beaver mine, in the Abitibi area of Ontario, Canada, comprises 2 inactive old shafts and a surrounding area explored using bulldozer costeans to expose magnetic anomalies. Gold and copper sulphides occur within massive magnetite rocks. Samples were collected from dumps at the old mineshafts and also from the nearby exploration costeans. 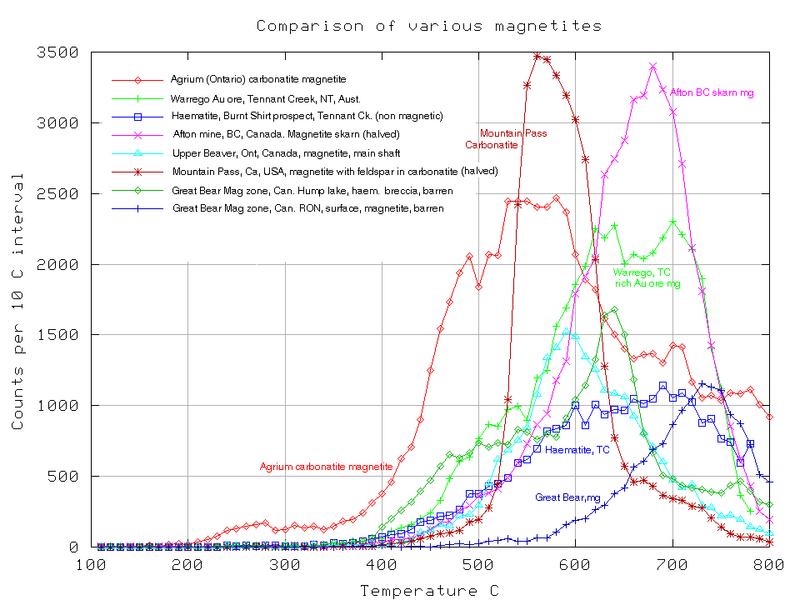 The magnetite samples show intense decrepitation over a range of temperatures from 500 to 700 ° C, but mostly around 600 to 650 ° C. Several samples show the presence of a second, lower temperature peak near 500 ° C. As sedimentary iron oxides and banded iron formations do not show appreciable decrepitation, the mineralised magnetite must be of epigenetic origin, derived from high temperature fluids. In the nearby costeans a banded iron formation is exposed. Samples of magnetite from these costeans contained no appreciable gold or copper, and also show negligible decrepitation. Decrepitation analyses of magnetite samples in this area readily distinguish between the mineralised, epigenetic magnetite bodies and the unmineralised sedimentary banded iron formation magnetite. 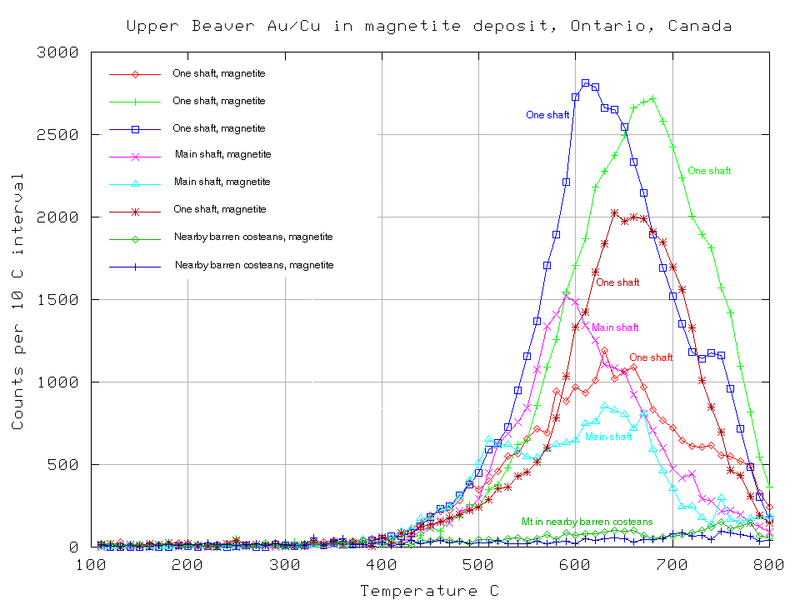 The wide range of decrepitation temperatures in the samples from the mine shaft dumps indicate that the magnetite formation was complex and the ore body is strongly zoned. It may be possible to use decrepitation to distinguish between phases of the ore body to aid in mine development. Because this study was limited to broken ore on old dumps it is not possible to work out the spatial relations of the temperature zonation in the magnetite. 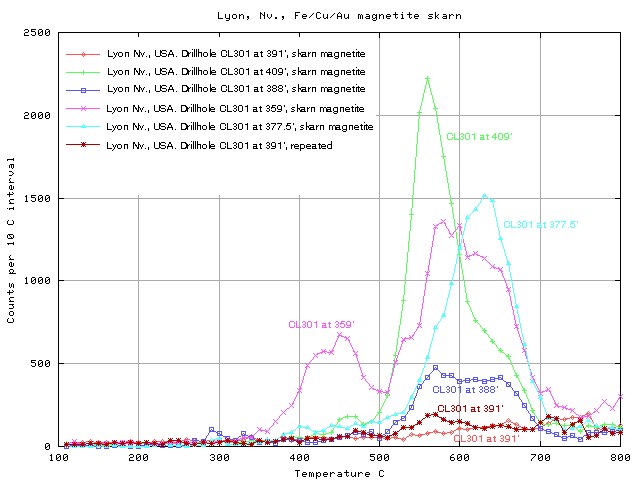 Magnetite (and haematite) are suitable minerals for decrepitation analyses. Because they are opaque, there is no other way to easily study fluid inclusions and temperature zonation in this class of ore deposits. Both magnetite and haematite are suitable minerals for decrepitation analyses and they commonly show intense and diverse decrepitation patterns. In these opaque minerals, there is no other easy way to collect fluid inclusion information. Although there is a tendancy to assume that these minerals are homogenous, the decrepitation results show significant differences within and between deposits, which can help with exploration and possibly mine development. As an exploration aid, decrepitation of magnetite samples can be used to discriminate between potentially mineralised bodies and barren sedimentary magnetite, as the latter do not give a decrepitation response. In addition, it should be possible to use decrepitation on these types of samples to define zonation within deposits or to discriminate between different magnetite types during exploration. The Buena Vista mine is in the Humboldt mafic complex, west-central Nevada, and was previously mined for iron. It has no associated base metal or gold and no sulphides. The deposit is probably a hydrothermal replacement type, although a strict magmatic origin has previously been proposed. 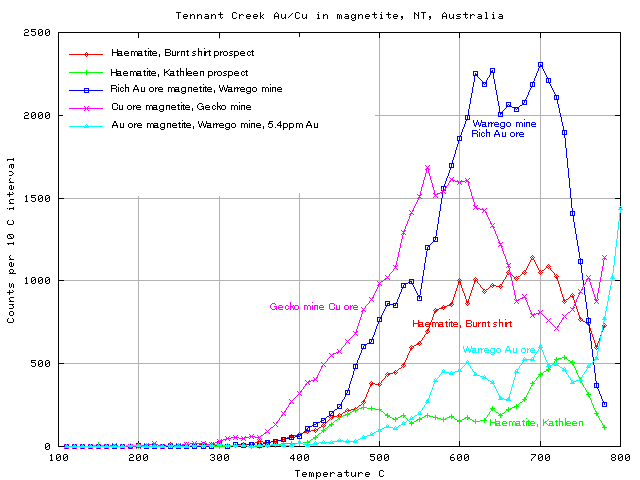 These samples are quite similar, with moderate intensidty decrepitation peaks near 650° C. The sample of magnetite from the stockwork veins has a major second peak near 450° C, and even a small peak at 240° C.
This group of samples shows more spatial consistency than either the skarn type deposits or the Tennant Ck., NT or Upper Beaver, Canada deposits, perhaps indicating a sytem dominated by meteoric rather than magmatic fluids. This deposit is a magnetite skarn with low levels of Cu (approx 0.2%) and very low gold values (typically less than 1ppm). Five samples were collected and analysed from one of the many core drillholes (CL301). 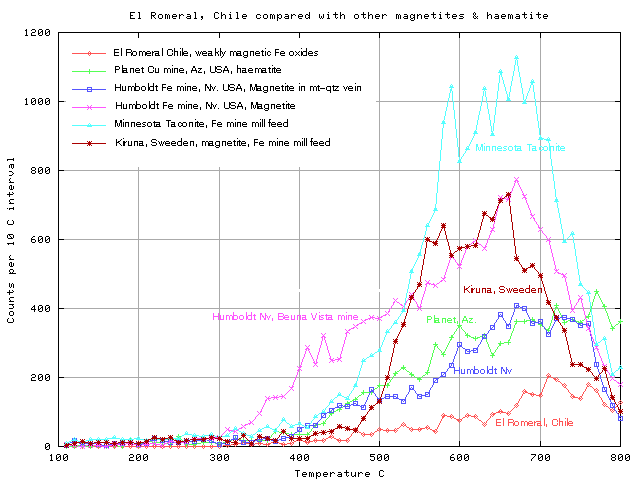 Only one sample from El Romeral mine, Chile, has been analysed, and it shows remarkably little decrepitation for a deposit which is described as hydrothermal. However, samples from other magnetite bodies which lack sulphides also show similarly low levels of decrepitation. 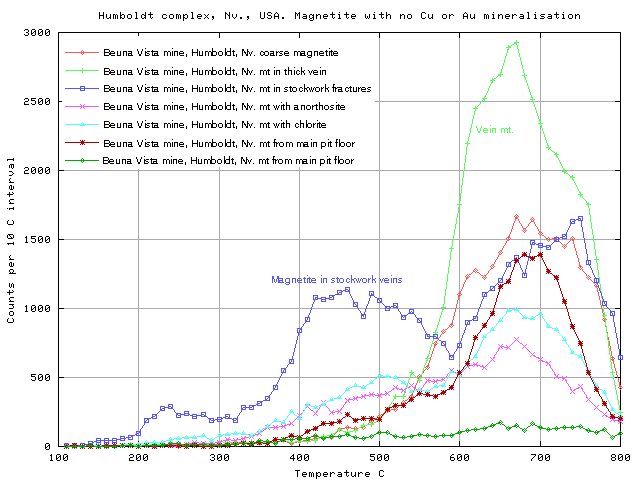 Samples from active Fe mines in Minnesota, and Sweeden, as well as the inactive Beuna Vista mine in the Humboldt comples, Nevada, all show weak but distinct decrepitation between 600 and 700° C. The Planet mine in Arizona is a detatchment related occurrence, with minor copper oxide showings nearby. This sample was from a stockwork of haematitic veins distant from any Cu mineralisation, and shows a very broad and weak decrepitation response. Why are these sulphide-deficient magnetite systems so different to the sulphide-associated magnetite bodies in which Au mineralisation often occurs? The Kingston Summit skarn is near death valley, southern California. Little is known about this deposit, although it seems to be a low-sulphide skarn, one mined for iron. The Agrium carbonatite, near Kapuskasing, Ontario, Canada is currently mined as a phosphate supply for fertiliser. Mountain Pass, California, has been a major rare earth element supply for many years. The sample from Mountain Pass was from a costean outside the active mine area, as mine access was prohibited. This sample was of magnetite in a feldspar-magnetite rock, of indeterminate relationship to the actual rare-earth carbonatite. 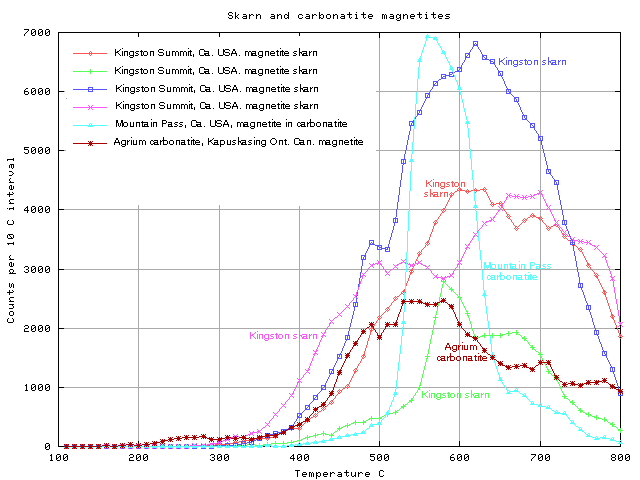 The samples from Kingston Summit all show intense decrepitation, with several separate temperature peaks. The decrepitation intensities tend to be more intense than the Lyon Skarn samples, but the presence of multiple temperature peaks is common to both these areas. The sample from Mountain Pass shows an unusually narrow single decrepitation peak at 660° C, suggesting a very well defined single temperature formation event. This is in contrast to the Agrium carbonatite sample which had a broad decrepitation peak. This area includes gold and copper mineralisation in magnetite and haematite host rocks. High bismuth contents are common and seriously devalue the copper ores. Banded iron formations are present throughout the area and the relationship between these sedimentary iron units and the mineralised haematite/magnetite bodies is unclear. Within individual orebodies, there are major temperature and intensity variations in the decrepitation, reflecting strong zoning and inhomogeneity of the ores. These variations occur over distances of metres and it has not been possible to date to define overall ore body zonation. Close spaced and detailed sampling is required to define zones in these complex ores. Sample descriptions - Tennant Ck.